Seeing all the beautiful flowers start to make their first appearance makes me so happy. Although fall is my favorite season, spring gives it a run for it’s money. If you come around these parts often, you know part of salvaging means thrifting and using what I got. 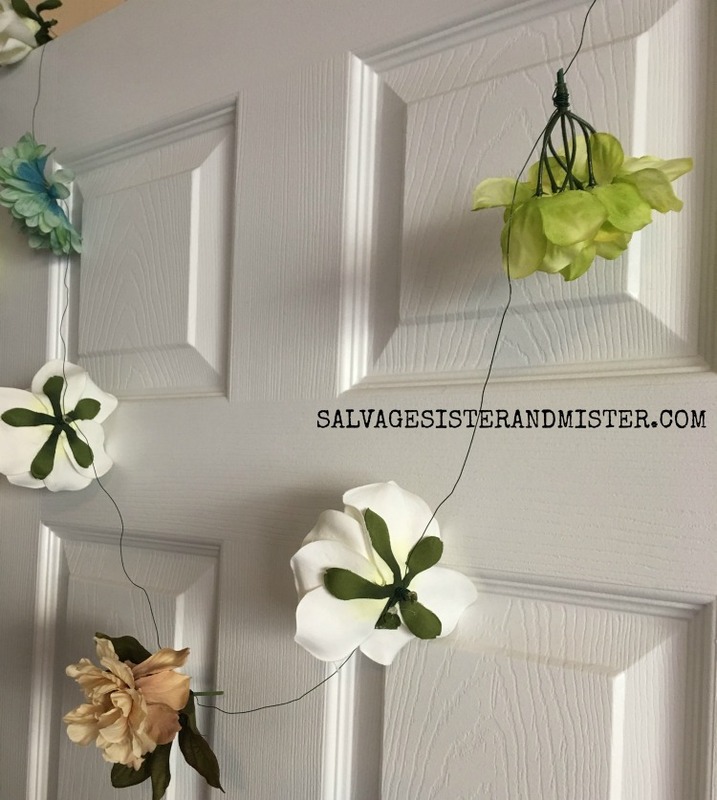 I had some thrifted artificial flowers, along with some flowers that were leftover from a wedding, that needed a new purpose in life…… other than staying in a box in my craft room. 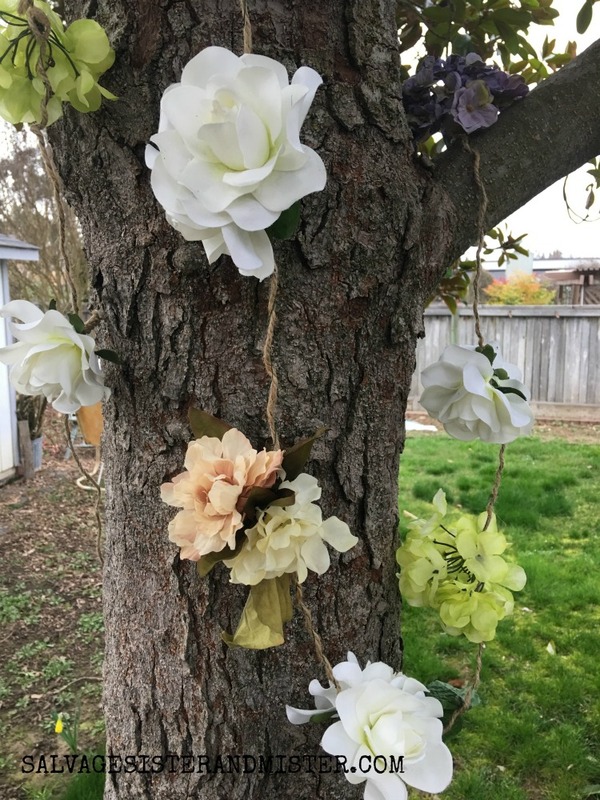 Since I am a sucker for garland, I decided to make up this….. 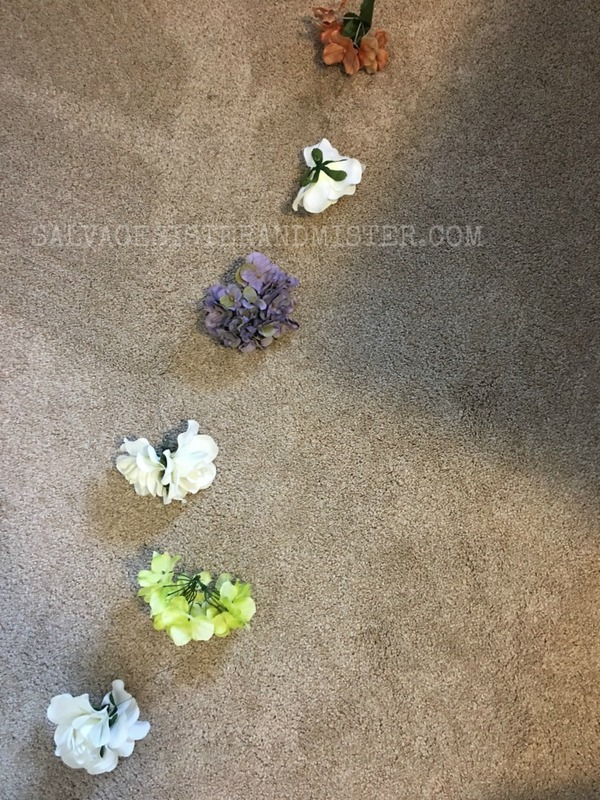 I used a pair of scissors to measure a distance of length of floral wire for the beginning of my garland – before flowers are added. This is the ends so you can tie the garland up. Flowers on a stem were pulled off. Most artificial stems are easy to remove the flowers. They generally just pull right off. If yours don’t, you can use wire cutters to remove them. Build your pattern of flowers before you start. Since I had more white flowers than any other, I used a white one every other flower. 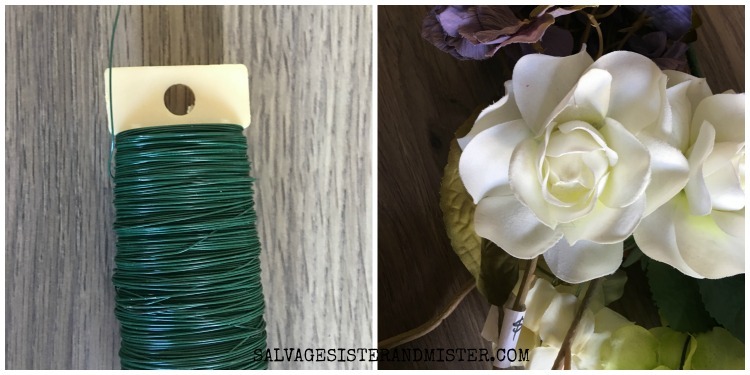 Using the nub of the flower stem, wrap it around the floral wire – using glue to secure if needed. The scissors were again used to measure the distance between flowers. Wrap around the flowers as you did in Step 4 , and repeat until all the flowers are used up. Once I got to the end, I used the scissors to measure the last part of the garland end (as I did in Step 1) and then cut the wire to end it. I added some additional flowers to the back of ones that needed more fullness. To do this, I cut some small pieces of wire and wrapped around the flower to the back of the original flower. Again, glue as needed. Next, I added jute string to cover the wire. This step is optional, but I liked the finished look. The best way to do this, for me, was to attach the end of the string to something tall so the string could be wrapped around in one continuous motion. I attached mine to the top of our magnetic chalkboard. 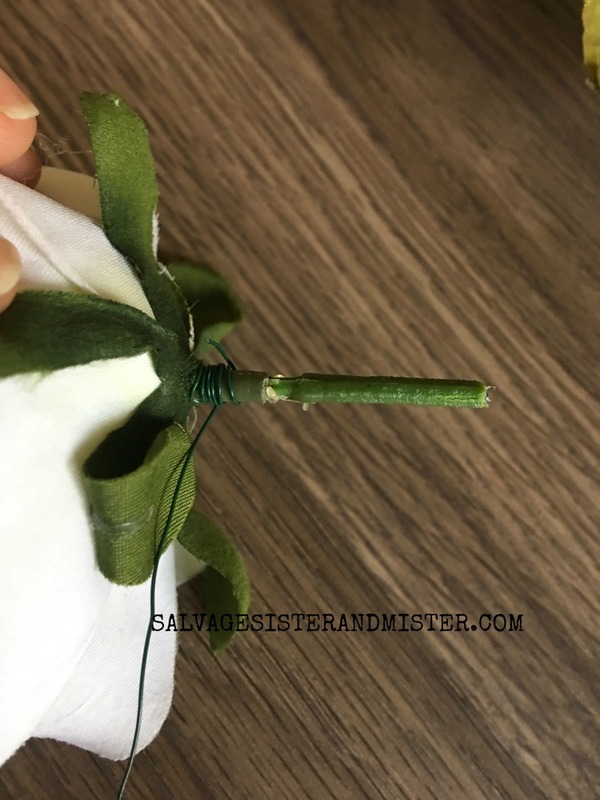 To start it, you need to wrap the floral string around the jute string, glue if needed. 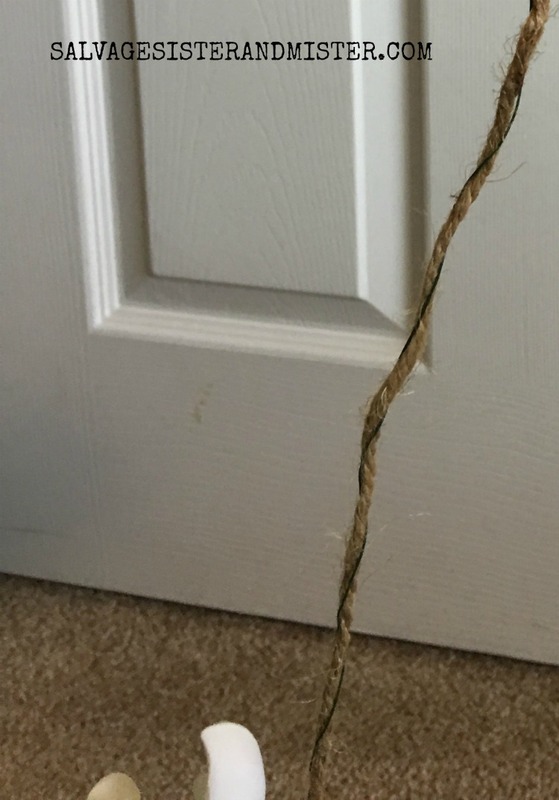 If there were any stems that needed to be covered with the jute string, I wrapped string and glued that section. Once I got to the end, I wrapped the end string piece, around the jute, just like at the beginning. Finally, I glued on any leaves between the flowers or by the flowers, as I liked. 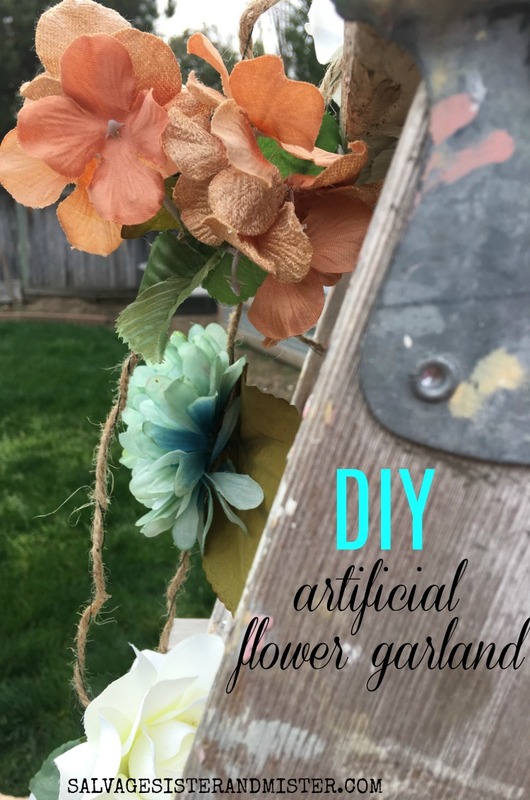 This artificial flower garland is great to use for parties or in your home decor. Tip – You could easily turn this into a wreath by wrapping it around one of these. 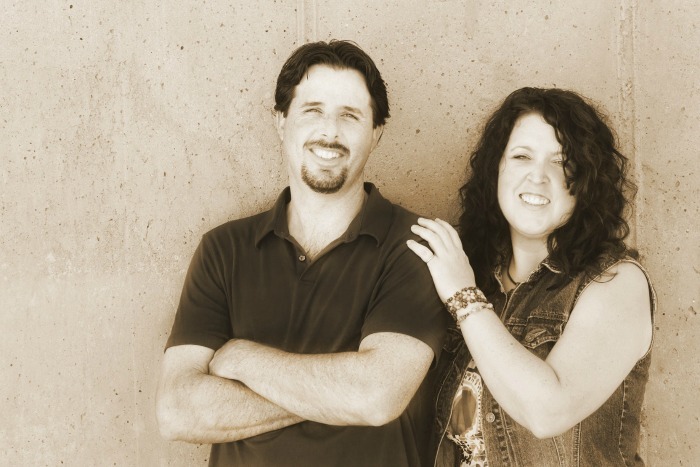 Thanks so much for stopping by and being part of the salvage community today! As mentioned, we are joining some other fantastic bloggers who are sharing their spring crafts, DIY projects, or vignettes with you today. These look fantastic hanging outside on your large tree. I can’t help but envy your green lawn, it will be at least May before ours looks like that. So pretty. 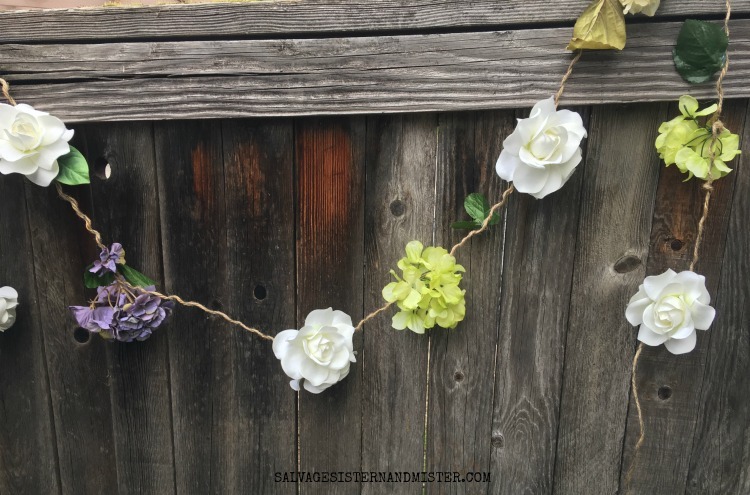 This is such a fun garland, I too love to hang garlands where ever I can and I love this idea of having it around a tree! Let Spring begin!! What a great project! I was actually thinking of making a garland like this but ended up making a paper one instead. This is on my list and when I post, I’ll be sure to mention your blog post! I love your post!!! Janine, How funny is that? Great minds! I can’t wait to see yours. It will be stunning as always. Such a sweet idea! They look so beautiful hanging from a tree! Perfect for a garden party! I love this flower garland and it looks so cool around the tree! How pretty, perfect for a shower or outdoor wedding. This is such a cute way to use artificial flowers. I want to make one of these to drape on my framed wall calendar, and could even change it out to match the seasons to the flowers. Thanks for linking up with us at the #HomeMattersParty this week. Nicole, I hope you get a chance to make one. They will be perfect for spring decor. Thanks for stopping by! Well, now if this isn’t the prettiest and most clever spring/summer project that doesn’t need watering, I don’t know what is! Love how easy it is to twist it to ones desired look! Donna, Well you just made my day. Thanks so much!!!!!!!!!! !